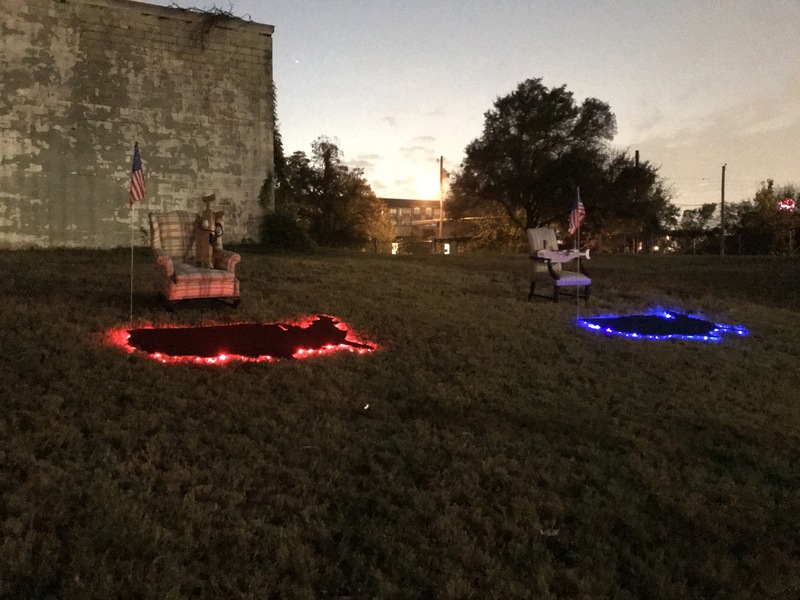 El Paso artist Angel Cabrales puts guns and easy chairs on the green for A-Hole in One. If your pockets aren’t deep enough to land a tee time at the new Trinity Forest Golf Club, let another South Dallas location quell your desires. This weekend, in conjunction with Cedars Open Studios, the MAC opens its latest exhibition, A-Hole in One by El Paso-based artist Angel Cabrales. The interactive outdoor golf-inspired exhibition engages viewers both politically and socially as they knock out a quick nine. The course sprawls out on a portion of the MAC’s grassy courtyard. Participants “tee-off” from the top of a small hill looking down onto a series of inviting global greens with challenging hole locations. On Cabrales’ course, however, keeping score goes beyond simple birdies and pars and delves into international politics, the military industrial complex, gun culture, and the President’s penchant for Twitter. The two Americas Cabrales refers to are the tee boxes at the top of the hill. Each is marked with a laser cut particleboard in the shape of the contiguous United States, topped with AstroTurf. Beneath the two Americas are strands of LED lights illuminating their edges. One is blue and one is red. The greens down-range are also in the shape of countries. These include Afghanistan, China, Iran, Iraq, Mexico, North Korea, Russia, Syria, and Venezuela. Lights also illuminate the countries with the Communist nations lit in red. Among these, there are seven hole locations located approximately were the capital city is geographically. Flagsticks bear the flag of each nation. There are also two sand traps: Afghanistan and Iraq. Each of the greens has its own title as well, coming from a well-known Trump remark. The Mexico green is titled “…and some, I assume, are good people.” “Rocket man is on a suicide mission” is North Korea’s title. Back in the tee boxes, golfers take aim at any of the nine countries. However, they won’t be swinging clubs to get their balls downrange. Cabrales built two motorized wooden guns to accomplish that and participants will be able to take their shots without even standing up. ‘A-Hole in One,’ by Angel Cabrales. PHOTO COURTESY THE MAC. “And of course, you can sit in the lounge chair so you too can be an armchair warrior and defend our country from your comfortable chair,” Cabrales says. Social, military, consumerist, and political themes are central to Cabrales’ work. For his MFA show at the University of North Texas in 2009, he created what he calls a trade show centered on selling products of fear. It featured a Cub Scout-inspired organization called the Blackwater Junior Corps, do-it-yourself hazmat suits, waterboarding demos, and a home-edition Patriot missile launcher. This kind of social and political engagement is a hallmark for exhibitions at the MAC. In recent years, its programming has featured artists with a message or who are themselves controversial in the eyes of some. This was especially true in April of 2016 when the MAC held an exhibition featuring the artists of the Stewpot at a time when Dallas was ineptly confronting its homelessness crisis. A-Hole in One, though, is the first time the gallery has held a show commenting so overtly on the current administration in Washington D.C.
“I think it was impossible to avoid now and we have always tried to have at least some sort of social element in the works that we’re showing,” says Rachel Rogerson, Executive Director of the MAC. A-Hole in One is a witty satire on our nation’s current state of affairs. With President Trump recently hitting the links for the 77th time since taking office, Cabrales’ medium makes for an even more impactful message. While his work might not sit well with some because of its confrontational nature, Cabrales’ intention is to simply open a dialogue. “A-Hole in One” will be on view Saturday, November 18 through Saturday, December 9, with an interactive performance as part of the 15th annual Cedars Open Studios on Saturday, November 18, 10AM-6PM. The exhibition is open to the public daily Wednesday-Saturday 12PM-5PM.